The Balmain 'Stripe Satin Blazer' which retails for a whopping USD$2,260.29 on Net-A-Porter seems to be a favorite among the South Korean celebrities. The blazer was worn by the stars at various events an TV programs. Sandara Park (박산다라) of 2NE1 at 2013 Seoul Music Awards. Kim Hee Sun (김희선) in episode 3 of 'Incarnation: Controller of the Heart (화신: 마음을 지배하는 자)'. Kim Hyoyeon (김효연) of Girls' Generation at 10 Corso Como Seoul Melody launch party. 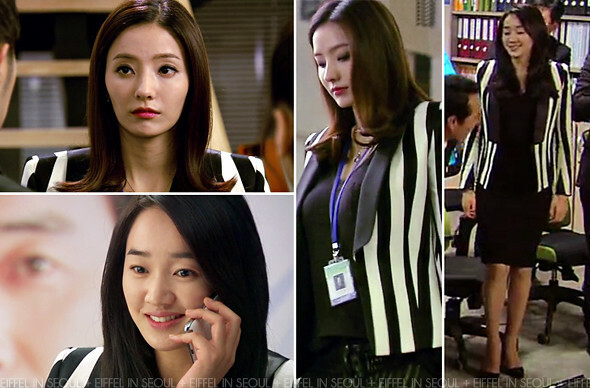 Han Chae Young (한채영) in episode 10 of 'Ad Genius Lee Tae Baek (광고천재 이태백)'. Soo Ae (수애) in episode 22 of 'Yawang (야왕)'.